The global minimally invasive surgical systems market is a diverse market comprising of two broad segments: surgical robotics and conventional minimally invasive surgical systems which include laparoscopy and endoscopy. The surgical robotics market comprises surgical robots that can perform minimally invasive surgeries with high accuracy and sensitivity through tiny incisions. One of the very first robotic surgical systems (Da Vinci Surgical System) was approved by the FDA in the year 2000 for performing general laparoscopic surgeries. This technique received a widespread acceptance within the medical community and was adopted by hospitals in the U.S. as well as Europe for the treatment of a wide range of medical conditions. A surgical robotic system typically comprises a camera arm and mechanical arms with miniaturized surgical instruments attached to them. The surgeon remotely controls the arms with the help of a computing console which provides the surgeon with high definition, magnified, 3-dimensional view of the entire surgical suite. Some of the major benefits, offered by robotic-assisted surgery, include: fewer post-operative complications such as surgical site infections, less pain and blood loss during the operation, quick recovery, and less scars. Conventional minimally invasive surgical systems form another dimension of the minimally invasive surgery (MIS) market which includes techniques such as laparoscopy and endoscopy. Laparoscopy is a minimally invasive surgical procedure which is used to examine the internal organs inside the abdomen. It utilizes a long, thin tube (laparoscope) in conjunction with a high-intensity light source and a high-resolution camera at the front and is inserted through small incisions in the abdominal wall. After the insertion, the camera fitted at the front takes high-quality images and sends them to a video monitor and provides the surgeon with enhanced visualization of the internal organs. Another technique called endoscopy is also a significant part of the conventional minimally invasive surgical market. It utilizes specialized instruments (endoscope) to visualize and operate on the internal organs (especially in the gastrointestinal track) as well as on the vessels of the body. An endoscope is typically a flexible, thin-shaped tube with an attached camera that provides the surgeon with enhanced visualization. In this technique, the surgeon inserts an endoscope through a small incision or opening in the body such as mouth. Endoscopic procedures are often named on the portion of the inspected digestive track such as upper GI endoscopy (examination of the esophagus, stomach, and the upper small bowel called duodenum), Colonoscopy (inspection of the abnormalities in the mucous lining of the intestine or bleeding in the colon), and Enteroscopy (examination of the small bowel), among others. The market report is well designed to provide an all-inclusive field of vision about the global minimally invasive surgical systems market in terms of various factors, such as recent trends, technological advancements, competitive landscape, and regulatory environment of the market. The scope of this report is centred upon conducting a detailed study of the solutions allied with the global minimally invasive surgical systems market. The market has been segmented into ‘Products’, ‘Components’, ‘Application’, ‘End Users’, and ‘Region’. The report presents the reader with an opportunity to unlock comprehensive insights with respect to the market and helps in forming well-informed strategic decisions. The research uncovers some of the substantial parameters that must be taken into consideration before entering the market. 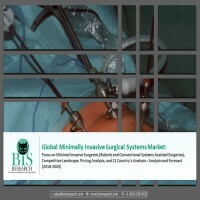 This research report aims at answering various aspects of the global minimally invasive surgical systems market with the help of the key factors driving the market, threats that can possibly inhibit the overall growth of the market, and the current investment opportunities that are going to shape the future trajectory of the market expansion. The study considers the Growth-Share Matrix Model for a comprehensive study of the global minimally invasive surgical systems market and assesses the factors governing the same. • What are the major market drivers, challenges, and opportunities in the global minimally invasive surgical systems market? • What was the market value of the leading segments and sub-segments of the global minimally invasive surgical systems market in 2017? • How will each segment of the global minimally invasive surgical systems market grow during the forecast period, and what will be the revenue generated by each of the segments by the end of 2025? • What are the influencing factors that may affect the market share of the leading players? • How will the industry evolve during the forecast period 2018- 2025? • What are the key developments and strategies that are implemented by the key players to sustain in this market? • What are the key application areas of the global minimally invasive surgical systems market? How are minimally invasive surgical systems employed in different areas of application? • Who are the key players in the global minimally invasive surgical systems market, and what are their contributions? • What is the scope of expansion by the key players of the global minimally invasive surgical systems market in Asia, Latin America, and Middle East? The competitive scenario in the global minimally invasive surgical systems market can be visualized as two different sub-groups- manufacturers of surgical robotic systems (such as Intuitive Surgical Inc., Mazor Robotics Ltd., Medrobotics Corporation, Auris Surgical Robotics, TransEnterix Inc., and Renishaw plc., among others) and manufacturers of laparoscopic and endoscopic instruments and equipment (Olympus Corporation, Hoya Corporation, Conmed Corporation, Ethicon Endo-Surgery, Inc., Encision, Inc., Stryker Corporation and Karl Storz, among others). 13.1.4 Corindus Vascular Robotics, Inc.
13.1.8 Zimmer Biomet Holdings, Inc.
13.2.8 FUJIFILM Medical Systems U.S.A., Inc.
Table 74 Overview: Accuray Inc.
Table 75 Recent Developments: Accuray Inc.
Table 77 Overview: Auris Health, Inc.
Table 78 Recent Developments: Auris Health, Inc.
Table 79 Overview: CMR Surgical Ltd.
Table 81 Overview: Corindus Vascular Robotics, Inc.
Table 82 Recent Developments: Corindus Vascular Robotics, Inc.
Table 83 Overview: Intuitive Surgical Inc.
Table 84 Recent Developments: Intuitive Surgical Inc.
Table 85 Overview: Mazor Robotics Ltd.
Table 86 Recent Developments: Mazor Robotics Ltd.
Table 89 Overview: Zimmer Biomet Holdings, Inc.
Table 91 Recent Developments: Zimmer Biomet Holdings, Inc.
Table 94 Overview: Microbot Medical Inc.
Table 95 Recent Developments: Microbot Medical Inc.
Table 96 Overview: Mimic Technologies, Inc.
Table 97 Overview: Renishaw Plc. Table 98 Overview: Restoration Robotics, Inc.
Table 99 Recent Developments: Restoration Robotics, Inc.
Table 104 Overview: Synaptive Medical Inc.
Table 105 Recent Developments: Synaptive Medical Inc.
Table 106 Overview: Think Surgical, Inc.
Table 107 Recent Developments: Think Surgical, Inc.
Table 108 Overview: Titan Medical Inc.
Table 109 Recent Developments: Titan Medical Inc.
Table 110 Overview: TransEnterix Inc.
Table 111 Recent Developments: TransEnterix Inc.
Table 114 Overview: Verb Surgical Inc.
Table 115 Recent Developments: Verb Surgical Inc.
Table 118 Overview: Arthrex Inc.
Table 119 Recent Developments: Arthrex Inc.
Table 126 Overview: Cogentix Medical, Inc.
Table 128 Recent Developments: Cogentix Medical, Inc.
Table 131 Overview: Fortimedix Surgical B.V.
Table 132 Recent Developments: Fortimedix Surgical B.V.
Table 133 Overview: FUJIFILM Medical Systems U.S.A., Inc.
Table 134 Recent Developments: FUJIFILM Medical Systems U.S.A., Inc.
Table 136 Overview: Ethicon US, LLC. The medical industry, globally, has witnessed several technological advancements in the recent years in diversified branches. For instance, previously, surgeries were performed by using open surgical procedures or conventional laparoscopic approaches, which witnessed a noteworthy transformation when advanced minimally invasive surgical procedures were introduced in the medical world. Medical robotics and computer-assisted surgical systems stood distinctively as the most advanced extension of minimally invasive surgical procedures. These systems can be segmented into three types: rehabilitation systems, hospitals and pharmacy systems, and surgical robotics systems. Among these, the surgical robotics systems are widely adopted across the globe at present. Factors, such as the rising demand for minimally invasive surgeries, rising incidence rate of chronic diseases, general awareness regarding computer-aided surgeries, rising disposable income, and the introduction of technologically advanced systems (SurgiBot, Amadeus, Single Port Orifice Robotic Technology, (SPORT), and Modus V, among others, are propelling the growth of this market. Introduced in the year 2000 with a slow initial growth, robotic surgeries have witnessed a tremendous rise in demand over the last two decades. For example, three years after the commercial launch of da Vinci surgical system, robotic-assisted surgeries accounted for only 1.5% of all minimally invasive surgeries in 2003. However, in 2015, robotic-assisted surgeries accounted for nearly 27% of all Minimally Invasive Procedures (MIS) procedures, and now the percentage has surged to more than 35%. Despite a significant surge in the number of robotic surgeries, the distribution of these surgeries varies intensely from country to country. Currently the U.S. is the only country with the highest adoption of robotic-assisted surgeries with more than 1,40,000 surgeries performed in the year 2015 alone. Apart from surgical robotics, conventional minimally invasive surgical systems also play a significant role in the growth of the overall MIS market and currently account for approximately 78% of the market. The revenue generated by the market for global conventional minimally invasive surgical equipment was approximately $18.87 billion in 2017 and is expected to grow at a compound annual growth rate (CAGR) of 4.90% during the forecast period. The growth in this field is majorly coming from the North America region which has an estimated addressable market value of around $6.83 billion contributing to approximately 34% of the overall market. On the other hand, endoscopy is the largest product category for the global conventional minimally invasive surgical systems market, contributing approximately $10.33 billion, which is anticipated to grow at a CAGR of 3.60% during the forecast period. However, the major growth segment is capsule endoscopy which is anticipated to grow at a double digit CAGR of 10.00% during the forecast period. The high growth rate can be attributed to the large number of colorectal cancer (CRC) screening programs conducted across many developed regions such as North America and Europe. Overall, in 2017, the global minimally invasive surgical systems market value was estimated at $23.95 billion, which is estimated to grow over $40.52 billion by 2025. The global minimally invasive surgical systems market is expected to grow at a double-digit CAGR from 2018 to 2025, driven by the rapidly increasing patient demand for undergoing minimally invasive or non-invasive surgical procedures, increasing surgical need especially with the rising geriatric population, and the surge in the prevalence of colorectal and other gastrointestinal related diseases. New technological advancements in the medical field, such as miniaturization of surgical equipment and development of surgical robots, have also spurred the market growth and substantially increased the number of minimally invasive surgeries performed across the world. In the future, the market for surgical robotic systems is expected to take over a lion’s share of the market due to the declining price per installation. Currently, cost is the major concern, which tends to hinder the market for minimally invasive surgical robotics systems within the medical community. However, with more players entering the market, there would be increased pressure on the existing players to reduce the overall price of the systems, resulting in greater adoption of robotic-assisted surgeries. Likewise, the demand for conventional surgical systems such as laparoscopy and endoscopy would also rise with the rapidly evolving technical capabilities of these systems. Hence, both conventional surgical systems and surgical robotics systems will facilitate the overall growth of the minimally invasive surgery market.